In IT, rarely is one truly developing something from the ground up. In many ways, IT is about making solutions work – disjointed as they may be. Large enterprise class solutions such as Email and messaging platforms, Content Management Systems, CRM’s, Directory Services, and Security Solutions all are massively complex - even if they are well designed. Those of us who are faced with the responsibility to “make it work” must possess the knack to be a deep-dive expert on any number of subjects, while having the big picture perspective of the IT Generalist. It can be a complex mix of factors that determine how well solutions end up working out. It’s usually an assorted mix of experience, technical and organizational skillsets, ingenuity, a lot of hard work, and a little bit of luck. This is how the seasoned IT veteran separates themselves from those less experienced. Then, every once in a while a piece of software comes along to make your life in IT easier. 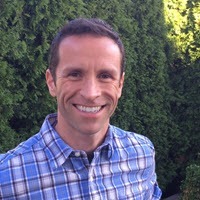 Software that helps bridge the much needed gaps that may exist in cross platform integration, connectivity, management, monitoring, or procedural tasks. These are applications that don’t make deploying or managing complex systems easy. They just make it a little easier. Sometimes you stumble upon helpful applications like these almost by accident, as I have. Others you knew of, but just never got around to trying out. So I thought I’d take a brief time-out from my recent focus on all things related to Virtualization, and take a moment to share a few of those applications that are currently making my life in IT a little easier. Some of these listed below are worthy of their own posts, which I hope to get around to. It is a list that is neither complete, nor appropriate for every environment, and their importance really depends on how much you need it. Only time will tell on which solutions become obsolete, and which one’s stand up over time. This may be the best product you’ve never heard of. If you ever need to transform, manipulate, or convert data from disparate systems, this is the product for you. No, it’s not a “utility” but an enterprise class solution that demands a commitment in time to learn. The results are stunning. Data sources that had no earthly intention of being able to talk to another system can share the same data. Example: Your Sales Department uses a CRM running on SQL, but an ERP or Finance system runs on Oracle, and you need those records to interact on a transaction by transaction basis. Scribe can do that, and much more. Are those systems running on separate networks? No problem. Scribe simplifies the communication channels between autonomous systems. It can insulate the complexity of convoluted database tables, and in some cases will completely eliminate the need for you to use an application’s SDK for data integration. Database Administrators would love this tool, but it’s power extends well beyond just database integration. It’s a true gem. You have a choice. Spend weeks and weeks trying to get PowerShell or vb scripts to analyze and manipulate your large flat-file storage contents, or spend a few bucks for Tree Size Pro. This product delivers. I’ve used it to generate reports on storage usage, and to automate flat file storage cleanup tasks. When I think about what it would have taken to do it programmatically, I’d still be working on it. I’ve written about OneNote before, and how it can be utilized in IT. Since that time, I’ve learned how to exploit it even more, and it goes with me everywhere. It could be 10 times the price it is, and I’d still pay for it myself if needed. It’s the pocket knife that should be in every Administrator’s tool chest. The larger your team, the better it works. Design documentation, troubleshooting active issues, project planning, research, etc. It will help you become a better Administrator. This software allows for Unix, Linux, and Mac systems to authenticate against Active Directory. It will allow for centralized management of these systems using Group Policy Objects in the same way you manage your windows machines. I was one of their first customers, and have been thrilled to see it mature over the years. Their Open Source edition is OEM integrated into Linux Distributions such as Ubuntu, Suse, and other products like VMware vSphere. The free/Open source edition allows for you to join these systems to AD, while the commercial edition allows for centralized management. If you need a solid windows based SSH client to connect to your Linux clients, this is it. One version (.56b) also supports the “Generic Security Services API” or GSSAPI. This means that if your Linux machines are domain joined using Likewise, you can leverage Active Directory to log in to that Linux system, inheriting your credentials so that it is all passwordless. Included with it is “plink” which gives you the ability to run a *nix command remotely from the windows system. Great for routines initiated from a windows workstation. “Pscp” is the putty SCP client for getting files to and from that connected *nix system. 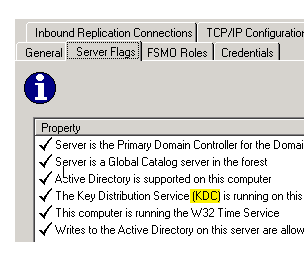 One of the interesting aspects of Active Directory is that there are object changes all the time, but as an Administrator, you have no way of knowing it. AD Change Notifier helps with that. Simple, yet effective. It sends you an email notification of object changes in AD. You can select whether you want all types of changes (modifies, creates, deletes), as well as particular object types (users, machines, OUs, GPOs, etc.). You learn a little about how objects change in AD, and if you delegate AD responsibility, how and what is being changed in AD. Long before the wonders of virtualization, there were byte-level disk imaging solutions to help you with your system protection and recovery needs. This was like magic at the time, especially as it was becoming obvious file based backups of system partitions were never any good in the first place. While it may not be needed in the Enterprise like it once was, there are still a few good use cases for it. It’s also pretty handy to have on your home system, and every one of your neighbors home systems. …Or the ones that know you’re in IT, and think you are their personalized technical support. Yet another tool from CionSystems. It takes the burden off of IT for user account related activities. Does the user need to change their cell phone number or their home address? Does a Department Manager need to change the Title of someone’s position? AD Self Service can do this, without ever giving these end users privileges. Updating AD related attributes is especially important if you use other solutions that leverage AD information (Exchange, SharePoint, CRM, etc.). AD Self Service also allows for a secure way for the user to unlock their locked out account. The more users you manage, the more this product will help take the burden off of IT. Some networking purists would flog me on the side of the head for recommending such a cheater app. But the fact is, I need quick and easy way to review subnetting options in order to make the right decision. I can subnet manually much like I can do arithmetic manually. I just choose not to. I have other projects to allocate my time to, and I need the speed of a calculator to help me visit those options more quickly. Subnet calculators like SolarWinds offer one other ability often overlooked; the ability to visualize the sizing of your subnetting. You can create problems by making subnets too small, or too large. Tools like this give a great visual representation of how you want to split networks. It doesn’t excuse the requirement that every Administrator should fully understand how subnetting works. (I still marvel at how brilliant IP subnetting is). It’s that once they do, an Administrator should be able to use a tool to make it easier and faster for them to make the correct decision. For as long as FTP has been around, and ubiquitous as it may seem, one might conclude that it all works the same. Not true. FTP Servers will have their own unique behaviors, just as FTP clients will have their own quirks. The firewalls that the FTP traffic pass through add another variable that can frustrate end users and Administrators alike. FileZilla seems to offer the most flexibility when working with remote FTP servers, and is what I use to handle a variety of different FTP needs. FileZilla won’t eliminate inherent complexities with the FTP protocol as it traverses multiple networks, it just makes it easier to negotiate. It’s hard to believe that as an IT administrator, one of my favorite applications I use is one of the least technical. Microsoft created an absolutely stellar application when they created OneNote. If you haven’t used it, you should. Most IT Administrators have high expectations of themselves. Somehow we expect to remember pretty much everything. Deployment planning, research, application specific installation steps and issues. Information gathering for troubleshooting, and documenting as-built installations. You might have information that you work with every day, and think “how could I ever forget that?” (you will), along with that obscure, required setting on your old phone system that hasn’t been looked at in years. The problem is that nobody can remember everything. After years of using my share of spiral binders, backs of print outs, and Post-It notes to gather and manage systems and technologies, I’ve realized a few things. 1.) I can’t read my own writing. 2.) I never wrote enough down for the information to be valuable. 3.) What I can’t fit on one physical page, I squeeze in on another page that makes no sense at all. 4.) The more I have to do, the more I tried (and failed) to figure out a way to file it. 5.) These notes eventually became meaningless, even though I knew I kept them for a reason. I just couldn’t remember why. Do you want to make a huge change in how you work? Read on. OneNote was first adopted by our Sales team several years ago, and while I knew what it was, I never bothered to use it for real IT projects until late in 2007, when a colleague of mine (thanks Glenn if you are reading) suggested that it was working well for him and his IT needs. Ever since then, I wonder how I ever worked without it. If you aren’t familiar with OneNote, there isn’t too much to understand. It’s an electronic Notebook. It’s arranged just as you’d expect a real notebook. The left side represents notebooks, the top area of tabs represent sections or earmarks, and the right side represents the pages in a notebook. It’s that easy. Just like it’s physical counterpart, it’s free-form formatting allows you to place object anywhere on a page (goodbye MS Word). What has transpired since my experiment to use OneNote is how well it tackles every single need I have in information gathering and mining of that data after the fact. Here are some examples. What better time to try out a new way of working on one of the biggest projects I’ve had to tackle in years, right? Virtualizing my infrastructure was a huge undertaking, and I had what seemed like an infinite amount of information to learn in a very short period of time, under all different types of subject matters. In a Notebook called “Virtualization” I had sections that narrowed subject matters down to things like ESX, SAN array, Blades, switchgear, UPS, etc. Each one of those sections had pages (at least a few dozen for the ESX section, as there was a lot to tackle) that were specific subject matters of information I needed to gather to learn about, or to keep for reference. Links, screen captures, etc. I dumped everything in there, including my deployment steps before, during, and after. Our Linux code compiling machines have very specific package installations and settings that need to be set before deployment. OneNote works great for this. The no-brainer checkboxes offer nice clarity. If you maintain different flavors of Unix or various distributions of Linux, you know how much the syntax can vary. OneNote helps keep your sanity. With so many Windows products going the way of Powershell, you’d better have your command line syntax down for that too. This has also worked well with backend installations. 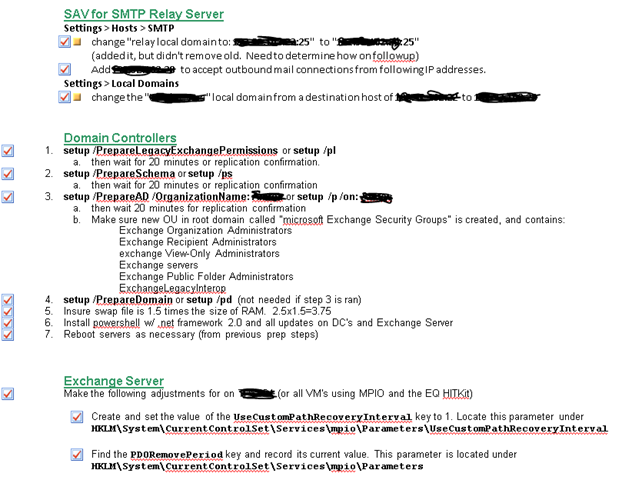 My Installations of VMware, SharePoint, Exchange, etc. have all been documented this way. It takes just a bit longer, but is invaluable later on. Below is a capture of part of my cutover plan from Exchange 2003 to Exchange 2007. After big migrations, you have to be on your toes to address issues that are difficult to predict. OneNote has allowed me to use a simple ISSUE/FIX approach. So, in an “Apps” notebook, under an “E2007 Migration” section, I might have a page called “Postfix” and it might look something like this. You can label these pages “Outstanding issues” or as I did for my ESX 3.5 to vSphere migration, “Postfix” pages. Those in the Engineering/Architectural world are quite familiar with As-built drawings. Those are drawings that reflect how things were really built. Many times in IT, deployment plans and documentation never go further than the day you deploy it. OneNote allows for an easy way to turn that deployment plan into a living copy, or as-built configuration of the product you just deployed. Configurations are as dynamic as the technologies that power them. Its best to know what sort of monster you created, and how to recreate it if you need to. Emergencies, impediments, fires, or whatever you’d like to call them, come up all the time. I’ve found OneNote to be most helpful in two specific areas on this type of task. I use it as a quick way to gather data on an issue that I can look at later (copying and pasting screenshot and URLs into OneNote), and for comparing the current state of a system against past configurations. Both ways help me solve the problems more quickly. One of the really interesting things about OneNote is that you can paste a screen capture of say, a dialog box in the notebook, then when searching later for a keyword, it will include those bitmaps in the search results!!!! Below is one of the search results OneNote pulled up when I searched for “KDC” This was a screen capture sitting in OneNote. Neat. How many times have you spent trying to organize your web browser bookmarks or favorites, only to never look at them again, or try to figure out why you bookmarked it? Its an exercise in futility. No more! Toss them all away. Paste those links into the various locations in OneNote (where the subject matter is applicable, and enter a brief little description on top of it, and you can always find it later when searching for it. I won’t ever go without using OneNote for projects large or small again. It is right next to my email as my most used application. OneNote users tend to be a loyal bunch, and after a few years of using it, I can see why. At about $80 retail, you can’t go wrong. And, lucky for you, it will be included in all versions of Office 2010. It’s difficult to put into words how exciting, and how overwhelming the idea of moving to a virtualized infrastructure was for me. In 12 months, I went from investigating solutions, to presenting our options to our senior management, onto the procurement process, followed by the design and implementation of the systems. And finally, making the transition of our physical machines to a virtualized environment. It has been an incredible amount of work, but equally as satisfying. The pressure to produce results was even bigger than the investment itself. With this particular project, I’ve taken away a few lessons I learned along the way, some of which had nothing to do with virtualization. Rather than providing endless technical details on this post, I thought I’d share what I learned that has nothing to do with vswitches or CPU Utilization. 1. The sell. I never would have been able to achieve what I achieved without the support of our Management Team. I’m an IT guy, and do not have a gift of crafty PowerPoint slides, and fluid presentation skills. But there was one slide that hit it out of the park for me. It showed how much this crazy idea was going to cost, but more importantly, how it compared against what we were going to spend anyway under a traditional environment. We had delayed server refreshing for a few years, and it was catching up to us. Without even factoring in the projected growth of the company, the two lines intersected in less than one year. I’m sure the dozen other slides helped support my proposal, but this one offered the clarity needed to get approval. 2. Let go. I tend to be self-reliant and made a habit of leaning on my own skills to get things done. At a smaller company, you get used to that. Time simply didn’t allow for that approach to be taken on this project. I needed help, and fast. I felt very fortunate to establish a great working relationship with Mosaic Technologies. They provided resources to me that gave me the knowledge I needed to make good purchasing decisions, then assisted with the high level design. I had access to a few of the most knowledgeable folks in the industry to help me move forward on the project, minimizing the floundering on my part. They also helped me with sorting out what could be done, versus real-world recommendations on deployment practices. It didn’t excuse me from the learning that needed to occur, and making it happen, but rather, helped speed up the process, and apply a virtualization solution to our environment correctly. There is no way I would have been able to do it in the time frame required without them. 3. Ditch the notebook. Consider the way you assemble what you’re learning. I’ve never needed to gather as much information on a project as this. I hated not knowing what I didn’t know. (take that Yogi Berra) I was pouring through books, white papers, and blogs to give myself a crash course on a number of different subjects – all at the same time because they needed to work together. Because of the enormity of the project, I decided from the outset that I needed to try something different. This was the first project where I abandoned scratchpads and binders, highlighters (mostly) and printouts. I documented ALL of my information in Microsoft OneNote. This was a huge success, which I will describe more in another post. 4. Tune into RSS feeds. Virtualization was a great example of a topic that many smart people dedicate their entire focus towards, then are kind enough to post this information on their blogs. Having feeds come right to your browser is the most efficient way to keep up on the content. Every day I’d see my listing of feeds for a few dozen or so VMware related blogs I was keeping track of. It was uncanny how timely, and how applicable some of the information posted was. Not every bit of information could be unconditionally trusted, but hey, it’s the Internet. 5. Understand the architecture. Looking back, I spent an inordinate amount of time in the design phase. Much of this was trying to fully understand what was being recommended to me by my resources at Mosaic, as well as other material, and how that compared to other environments. At times, grass grew faster than I was moving on the project at the time, (exacerbated by other projects getting in the way) but I don’t regret my stubbornness to understand what was I was trying to absorb before moving forward. We now have a scalable, robust system that helps avoid some of the common mistakes I see occur on user forums. 6. Don’t be a renegade. Learn from those who really know what they are doing, and choose proven technologies, while recognizing trends in the fast-moving virtualization industry. For me there was a higher up front cost to this approach, but time didn’t allow for any experimentation. It helped me settle on VMware ESX powered by Dell blades, running on a Dell/EqualLogic iSCSI SAN. That is not a suggestion that a different, or lesser configuration will not work, but for me, it helped expedite my deployment. 7. Just because you are a small shop, doesn’t mean you don’t have to think big. Much of my design considerations surrounded planning for the future. How the system could scale and change, and how to minimize the headaches with those changes. I wanted my VLAN’s arranged logically, and address boundaries configured in a way that would make sense for growth. For a company of about 50 employees/120 systems, I never had to deal with this very much. Thanks to another good friend of mine whom I’d been corresponding with on a project a few months prior, I was able to get things started on the right foot. I’ll tell you more about this in a later post. The results of the project have exceeded my expectations. It’s working even better than I anticipated, and has already proven it’s value when I had a hardware failure occur. We’ve migrated over 20 of our production systems to the new environment, and will have about 20 more up online within about 6 months. There is a tremendous amount of work yet to be completed, but the benefits are paying for themselves already.